Pogoplug joins the long list of free cloud services with its new Pogoplug cloud. With apps for all major platforms for smartphones as well as computers. The new cloud offers seamless connectivity b/w all platforms. The first 5Gb is free and you can upgrade to a bigger 50GB or 100GB for US $ 9.95 & $19.95 / month respectively. You also have the ability to make and share folders just like dropbox, and if you are the social type you can even share your activity of Facebook and Twitter. SAN FRANCISCO–(BUSINESS WIRE)–Pogoplug, creators of the award-winning line of streaming and sharing devices, today unveiled a new service: Pogoplug Cloud. The service provides users with a secure online space to store personal content and instantly share and stream it from their mobile device. Users sign up directly from any mobile phone, tablet or web browser and immediately receive their free 5GB Pogoplug Cloud. Pogoplug is the only service to offer infinite expansion. Users can purchase additional online storage from Pogoplug, or host a private, unlimited cloud for no monthly fees by buying a Pogoplug box and connecting it to a home or office network. – Store: Automatically upload photos and videos from your mobile phone to your Pogoplug Cloud-no sync required. – Share: Instantly share anything in your cloud through email, Facebook, Twitter and Google+. Create shared folders and collaborate with friends and colleagues. – Stream: Stream HD videos, photos and music from your Pogoplug Cloud to your phone. 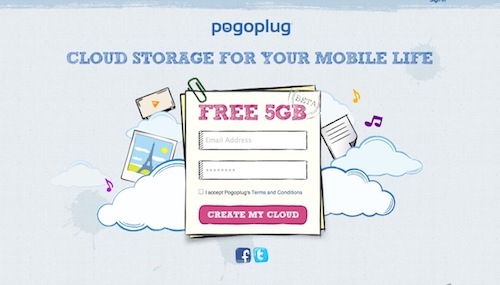 Pogoplug offers 5GB of free cloud storage. 50GB and 100GB of additional cloud storage are available for $9.95/month and $19.95/month, respectively. Pogoplug Cloud is available today at www.pogoplug.com. Pogoplug’s iOS and Android apps are FREE and available for download in the iTunes Store and Android Marketplace. The full range of Pogoplug hardware and software products are available at www.pogoplug.com. Pogoplug is cloud storage for your mobile life. The service enables users to store, share and stream personal content from any mobile device. Pogoplug is the only service that provides flexible expansion options by allowing users to purchase additional cloud-based storage or to host a private unlimited cloud for no monthly fees by purchasing a Pogoplug box.